Fr. John Catoir’s new DVD Available! 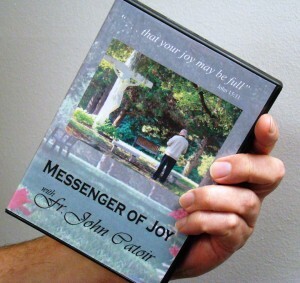 Copies of this DVD can be ordered in the Messenger of Joy online Store or can be ordered directly. Send all checks for this DVD payable to: Martin Media Management, Inc., P. O. Box 836710, Richardson, Texas 75083-6710. For larger orders, please call 972-235-2222. The price includes shipping and handling. We invite you to order extra copies for those family or friends who may need to hear this uplifting message of joy! We recently uploaded parts 1 and 2 of “Joy is a Choice” by Father John Catoir. You can watch these videos below or by visiting our video archive page on the Messenger of Joy website. We hope that you enjoy these videos, and we plan on adding more in the future. We hope you like our new web site. You can navigate by using the menu at the top of the screen, or at the right hand side. We are still working on some areas, but we hope to have these finished in the near future. For now, enjoy the new content, and keep checking back for frequent updates. Also, if you haven’t subscribed to our free monthly newsletter, click here. Thank you. Messenger of Joy is powered by	WordPress 3.4.2 and delivered to you in 0.282 seconds using 30 queries.